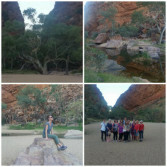 In Sept I hosted my first tour Desert Awakenings and this was a dream come true and has been many years in the making. 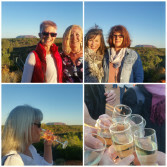 A fabulous group of women joined me in the Northern Territory for 5 days of country, culture and connection. 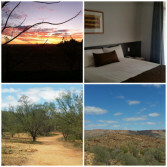 Our time in the outback began in Alice Springs – Mparntwe is the heart + soul of the outback. There are so many sacred sites around the town that no matter where you go you are walking on sacred land and you can actually feel this. To me, to understand Uluru you need to begin in Alice Springs to get in touch with the importance of Aboriginal culture but also for us city slickers it’s to get re-acquainted with a slower pace of living. Our welcome dinner was with our guide and bush master chef Bob. Bob shared his story which moved us to silence. He is such a gentle soul and we all felt touched by his spirit. 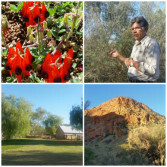 Bob shared the beauty of Simpson’s Gap – Rrengetyirpe which is important to the Central Arrernte people. We were blessed to be the only group there so it was quiet and so peaceful. 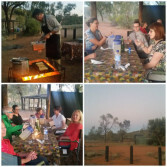 We also visited the site of the original Alice Springs before moving on to a quiet spot for our delicious bush tucker barbeque under a galaxy of stars. A highlight of the whole trip! 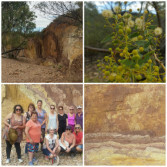 With our new guide Jen we explored The Ochre Pits (and no they weren’t the pits) a sacred site as the ochre is still used today for painting and decoration so it’s a look but don’t touch experience. 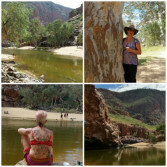 We blissed out Orminston Gorge – Kwartatuma which is quite simply breathtaking. No words can do this sacred site justice. As we were walking into the gorge we could hear singing and Hallelujah and Amazing Grace welcomed us into the gorge. A South African choir was visiting Alice Springs for a singing festival and they were preparing for a concert so lucky us! Divine Timing. We sat, relaxed, breathed it in, soaked it up and could have stayed all day! Our first night at Yulara we enjoyed the Sounds of Silence Dinner… It was a life-time experience where we may have just been the loudest table there due to all the laughter! It was a fabulous one off evening and well worth the money. 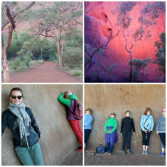 With a morning meditative walk around Uluru with our guide Jen, we were able to take our time and stop at several sacred sites just to be present and to feel, breathe + be. 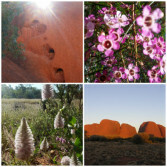 Jen shared the stories of the Mutitjulu people and Uluru. 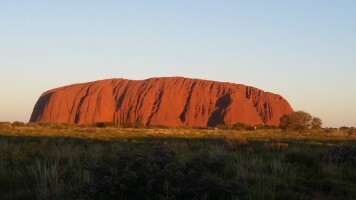 Uluru is magnificent at any time of the day really! Along our journey we met a very special soul who asked to join our tour. 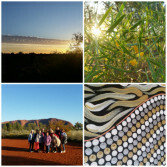 Barbara Randall spent time with us at Kata Tjuta and Uluru sunset and shared her stories. We were moved to tears with her words about stolen generation, culture, her love for her husband and where to from here for the local Mutitjulu people. 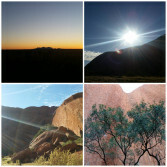 Kata Tjuta is a sacred men’s site so here I allow it to be experiential rather than guided. Some wandered the site connecting to the power source whilst others sat with Barbara, Jen and myself and talked story. It was pretty special. 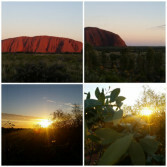 Our last morning we enjoyed Uluru Sunrise which although busy with busloads of tourists you can close them out and just be with nature. A new sunrise, new beginnings and our last breakfast together before we all hugged and went off to our lives feeling restored, excited and inspired. Have you ever experienced something and just knew in that moment that this is what you want to do? Well hosting Tours to sacred sites was it for me. I knew on this Tour that I had found what I always wanted to do. Pretty big! 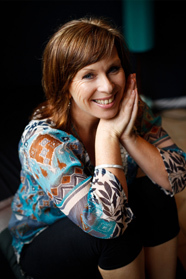 Journey’s for the Soul (the Tour side of Feminine Spirit) will be offering more tours to sacred sites over the coming years and I hope to welcome you aboard soon….